Although Krisztina and fiancé Graeme are thrilled with their new kitchen extension, when they bought the two-bedroom ground-floor flat four years ago, it was in a sorry state. After a lengthy search, they finally found a dated garden flat in a five-storey Victorian terrace. Having stretched themselves to buy the flat, they lived in it for two and a half years before starting any work. 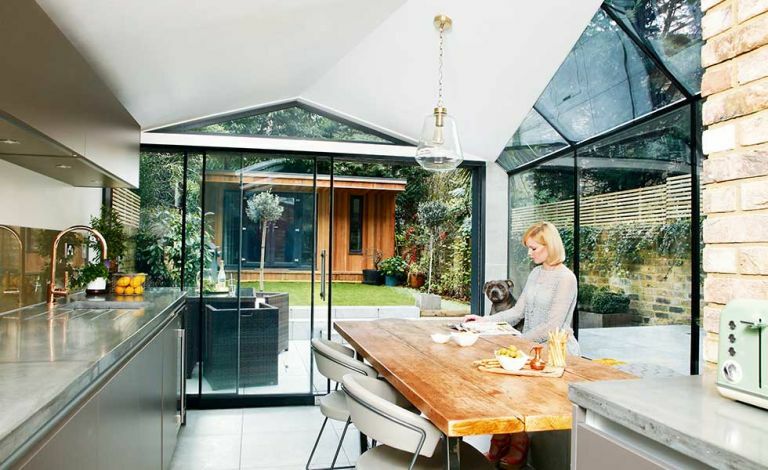 It made sense to knock the old kitchen, bathroom and one of the bedrooms together to create a new living room, and build a new kitchen-diner extension leading off it, to make the most of the garden views. Their vision also involved transforming the original living room at the front of the house into a bedroom and bathroom. Find our how they did it, then browse through more real home transformations and find out more about extending a house. The couple’s architect adapted the kitchen extension plans several times before they were approved. ‘It helped that we chose a glazed structure with a zinc roof and large sliding doors with slim frames, rather than bi-folds, which tend to be chunkier,’ says Graeme. The design includes a 2.8-metre side-return extension linked to a 3.2 metre glass box added to the rear. After receiving quotes from 12 different builders, analysing references, speaking to previous clients and viewing pictures of past projects, the couple chose a builder and rented a flat in Clapham for five months during the work. As it was the couple’s first big project, they hired interior design firm Day True to help create a cohesive feel throughout the flat. The couple’s small original kitchen had a side door to the yard, with the bathroom to the rear of it. The glazed extension offers a welcoming space for socialising. The sociable dining area was at the heart of the couple’s vision for the new space. The worktops tie in brilliantly with the handleless laminate kitchen units, sourced from a friend’s firm, Modo Cucine. Backing onto the new windows is a built-in heated concrete bench seat, a detail suggested by the architect.